The holes are used for programming “acupuncture style”. It doesn’t start turning on fully until 3V or so (at 25C). And as it gets hotter it needs more volts, at least 4V at max Tj (125C). Aha, I didn’t know that. I’ve built a few and they all turn on lower than 2.7V, but probably not fully as you say. I’m all ears when it comes to these things. Do you have another suggestion? In regards to it’s PWM characteristics, I don’t care at all because I don’t use PWM on it. I only use it for full blast on, I have the CN571x regulators for lower modes. It actually isn’t there for reverse polarity protection, even if it does that too. It’s there for the OTSM cap. But once again, I’m all ears for these things. Will a Pfet prevent OTSM cap drain? No reverse leakage? The diode does a good job of it. In my calibration and voltage reading I have a simple compensation routine for the voltage drop over the diode. Sure, it’s not perfect calibration, but during my tests with other methods of calibrating voltage, perfection is not easily obtained anyway. I have about 5% tolerance, I’m totally fine with that. Still, interested in the Pfet solution, I’d surely need to test it to make sure it doesn’t leak the OTSM cap. If it’s just a simple component replacement and I can fit it, no reason not to implement it in future versions. The Pfet is a great solution for reverse polarity protection, but as I said it conducts both ways, so current can flow either way, as long as the FET has gate drive. To use it for reverse protection, you actually connect it “backwards” so the body diode is conducting when in the correct configuration (i.e. source and drain reversed from what you might conventionally expect). Page 7. For a more detailed explanation of how it is typically used in e.g. automotive electronics. Problem is, for e.g. OTSM, is that, unlike a diode, the Pfet will continue to conduct in either direction as long as it has gate drive, meaning that in a typical torch, even when the drive to the LED is disconnected by the MCU, there is a “reverse” (actually forwards, in the usual sense) current path back through the Pfet, which will instantaneously discharge the OTSM cap into the LED. Whether e-switch or clicky. Until it ceases to drive the gate. I haven’t thought about your high-side drive arrangement, there may be some better possibilities with that. My only concern about using a simple Schottky instead is because of the concerns with previous Attiny versions, in standard, and selected low voltage versions, and the experiments with BOD, possible flash corruption whilst saving settings in particular circumstances etc. Where a few more 100 mV supply might help. I’m all ears when it comes to these things. Do you have another suggestion? I’ll look into it, but I don’t think you need to worry particularly, with your choice. It’s easy for me to look at data sheets and do “design review” at a distance and question edge cases, but your practical experience counts for much more. Besides wanting more memory it was the BOD functionality for OTSM that lead me on to the 1634. With the 1634, BOD enabled and a 47uF cap I get about 7 seconds of reliable off time when measuring with 125ms intervals. I could not get anywhere near that with BOD enabled on the 85. BTW, these drivers won’t fit Emisar D1 because they are double-sided, will they? I don’t have one so I can’t say. I tried a quick search for a photo showing the spring side of the D1 driver but couldn’t find one. I only found photos showing top side of driver so I can’t see what it is that prevents using double sided drivers in the D1. I have not really tested how the thermal throttling actually works on either of them. I’ve now done some thermal throttling tests on the CN5711 (the 1.5A regulator on Slim-4). I did not test a floating regulator, I did the tests with a Slim-4 driver out on my wooden desk, not mounted in a flashlight host. The amp measurements are from the power supply display, the volt measurements are with a DMM, the temperature measurements are with the 1634’s internal temp sensor. I set the digi-pot for a value that would regulate current to 0.75A, which is half of the CN5711 rating. I first tested with power supply measured at 4.35V. Current drawn was 0.74A and voltage over LED was 2.87V. Initial startup the temp reading was 25C, after 5 min 58C, then no more increase after leaving it like this for 30 minutes. Current drawn throughout this test was 0.74A, so no throttling in these conditions. I obviously have to turn it up a bit… I turned voltage up to a 6.3V, which is a little above max 6V rating. Voltage over LED was still at 2.87V throughout the test. Initial startup the temp reading was 33C. The higher voltage most certainly impacts result, but it’s the increments that are of interest. Behold, after 20 seconds the regulator started throttling down. Throttling speed decreased as the current dropped. I then lowered voltage to 5V and the current slowly increased and halted at about 0.7A, no change after 10 minutes. I lowered the voltage further down to 4.5V and the current increased back to the initial non-throttled 0.74A, no change after 30 minutes. So in my books the temperature throttling of these regulators appears to work as advertised. With them I don’t really see the need of a temperature throttled mode as they appear to take care of it well enough themselves. I’ll still have overheating protection, especially with the Fat-3 on full blast, but for now my plans of implementing a thermal throttling routine appears to be unnecessary. Of coarse the temp measurements themselves have to be taken with a few buckets of salt but I trust them enough to be able to determine weather the temperature is increasing, decreasing or stable. Edit: Edited so results are somewhat easier to read. I was afraid that D1 was too much optimised for size and that the extra 1mm would prevent battery contact. But I can always make the contact ring a little higher…so it would work. So I have a host. And I have a LED – White Flat. I would love to win a Slim-4. I like having visually even spacing of modes. I prefer to have last-mode memory. But I can live without it. If there’s no last-mode memory, then I want no more than 4 modes, including the Moonlight, or low-low mode. But with memory, there can be more middle modes. I like to have access from off to both the lowest mode and the highest mode. These could be special click sequences, like click-hold or double-click. I prefer single-click turn on in last used mode (with mode memory) or lowest mode (without mode memory), and also single click to turn off. I prefer thermal regulation instead of timers. I want LVP with a warning a few mV before cut-off. I have some lights that don’t meet all my preferences, and I still like them and use them. But, the preferences are cumulative. The closer the lights are to my ideal set-up, the more I like them and the more often I use them. 3) Light levels ? Depends very much on the lights output capability .. Though I really like lights that ramp .. Considering the relationship between driving current, related emitter output and the way humans perceive light intensity (sort of logarithmical way), noteworthy increases in output are required for noticeable, practical mode spacing. Starting off high mode (100%) and dividing it each subsequent time by 1/3 is a good way to attain a simple set of well spaced modes which can be rounded off with a super low mode. Let's say 100%, 33%, 11% and then some moonlight (0.1 - 0.5%) mode. Just an example. Count me in. I like the narsil firmware for the option of stepping or ramping, dr jones lucidrv for the ability to set the number of steps and tune the level of each step, and the max current configurability in the firmware used in the led4power ld drivers. For me, option of ramping or configurable steps, max current options, double click turbo, hold for moonlight, configurable thermal step down, configurable pwm fan control, and a jumper configurable 1s/2s would be the ultimate. Thanks for the suggestions, looking at them all. Keep’em coming! My firmware has the ability to select number of modes (currently up to 6) and adjust them to your liking. All your other preferences are already in my “normal” firmware, I just have to wrap it all together. It’s basically the setup menu system I am currently working on. From that photo it looks like it should fit, I can’t see why it wouldn’t. and a jumper configurable 1s/2s would be the ultimate. The regulators I’ve used in Fat-3 and Slim-4 are rated for max 6 volts so I haven’t made a 2S version. They seem to be able to handle more, but how much more I don’t yet know, maybe I’ll test a few to death and see. They work pretty well, but for 1S I prefer these CN571x regulators by far. They are much cheaper and handle heat much better than the CAT4104s. The 4104s have thermal shutdown, not throttling like the CN571x. It’s annoying when a few of them overheat and enter the cycle of overheating and cooling. If LED vf is much lower than battery voltage they overheat rather quickly. Normally in the host, with battery inserted and body fully screwed-in the spring is fully or nearly fully compressed, it’s basically flat. So any component being as high as a flattened lens or nearly as high may collide with battery. I haven’t measured what “nearly” is in the “nearly fully compressed” though. All I know is that it’s a small value. What’s the spring on the tailcap like? Can you replace it with a smaller one to ease the load on the front spring? I’ll be installing a small Nanjg style spring on each of these drivers, it’s the only spring that will fit. They can be shortened if needed I guess. Edit: possibly them small brass pucks could work… I have a few, gotta check when I get home. So…one way or another I can make it work. Isn’t the construction of D1 and D4 similar regarding the driver part? 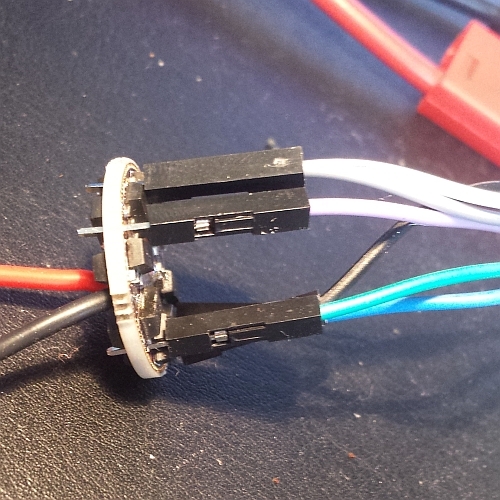 If yes, a double sided driver can be used, I did this in my D4 RGBW mod, see link below. But the stock driver is 22 mm in diameter. Just a question to anyone and everyone who likes moon mode with a “traditional” mode up/down interface. Is it preferred to have moon mode only accessible with a shortcut? If so, what shortcut? I’d like to know for both E-switch and off-switch/clicky lights. Or do people prefer to have moon mode in the regular mode cycle? b) in another situation, using the Olight S1R Baton or the Olight M2R Warrior, both have the option to access moonlight from a long click&hold when OFF. When advancing the modes (ML > L > M….) , the ML is no longer on the way unless you switch the light OFF and then do the click & hold again. I find both situations very useful although very different, once on the first we have a momentary clicky switch (the way I use it: 3 or 4 modes + turbo with double click, with ML on the regular cycle) and on the second an e-switch (ML only accessible from click & hold from OFF and then out of the regular cycle). 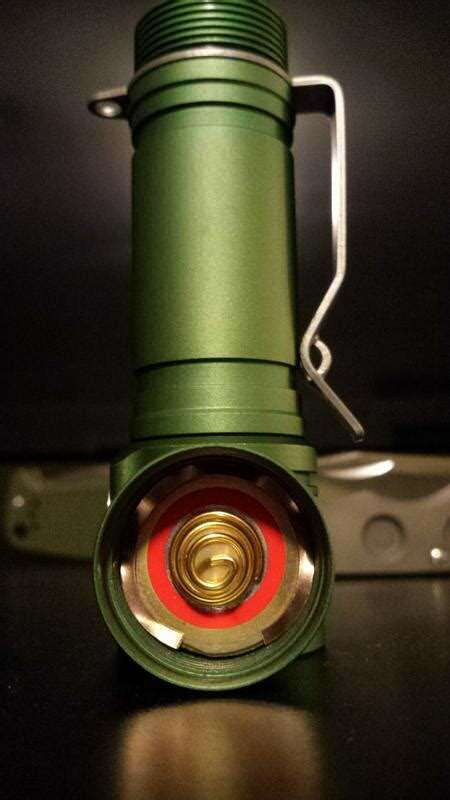 If I had to chose, I guess a shortcut from OFF to ML is always a good thing to have, with the possibility to advance further on the modes and then letting ML out of the cycle (as Olight does). But always with the possibility to access ML from OFF. Also, Emisar D4 , with ramping IOS, has that possibility, to click & hold from OFF and starting to ramp from the lowest level. This exactly. I like the click-hold from off shortcut to Moonlight and thereafter normal modes (without Moonlight in the cycle). It would also be great if it were possible to go two directions through modes, especially in cases of more than four modes being available. In that scenario, being able to hit Moonlight by cycling backwards into it would also be nice. My favourite is starting ML and going up, with direct shortcut to moon. I guess the last one could simply be a configurable “favourite mode”. Thanks for the input! I’ve always had click and hold from off (E-switch) starts setup menu selection and hidden modes. I can easily change that to double click and hold on second from off. In my “traditional” mode up/down interface for E-switch lights I go in both directions. Click and keep holding cycles up and stops on highest mode/boost. Double click and hold on second cycles down and stops on lowest mode. Wrap around is only enabled if mode change is initiated from one of the ends, like mode up from boost or mode down from lowest mode. For clicky switch lights I have short off press for mode up, long off press for mode down. I will implement a few settings for moonlight options. Menu settings and changing options is more challenging for clicky switch lights, in particular forward clicky. In these cases I think setting up the light as desired during flash faze is essential, even though menu options will still be available. Exciting drivers Mike C. Thanks for the opportunity. The SLIM-4 most interests me. The high-side regulation would make it these great for emitters with cathode connected thermal pads and lights with no thermal pad. 2 switches, one mechanical only for power on/off and second electronic switch for mode operation. 3 modes in total, about 20%, 50% and 100%, no moonlight/firefly, no strobe, sos, only blinking mode I would accept would be bike mode (and it’s not actually blinky, more like pulsating, 60% constant output with occasional (every second or third second) short “spike” to 100%. But this has to be “hidden” mode. It remembers mode you used when powering off regardless how long you used it for. Small red led around the e-switch to indicate low battery. There is an alternative for mechanical switch + e-switch lights. you select a wanted mode slot with short clicking, then press and hold to adjust output level, light will ramp up thru 10 or 12 intensity levels, when it gets to max you get 2 short blinks so you would know “this is the max”, if you keep holding e-switch you are going to min and ramping in steps starts again. Memory is instant, it does not depend on time, if you click e-switch to use 3rd memorised level and then instantly turn off the flashlight with mechanical switch it will power on in 3rd memorised level. More complex version would be for e-switch only lights. Long (0,5 seconds or so) press from any mode to turn it off. 4 modes, that includes moonlight and “turbo” + described hidden bike mode. Maybe we can use an e-Compass to create a pretty unique UI. Click for on and off (with double click for turbo, and all the other fancy shortcuts), but then hold, and rotate the light to control brightness. Clockwise for more, counter-clockwise for less output. Something between 90°-120° from low to high could be great. Involves communication between MCU and magnet field sensor though. People's too fond of super-low modes, they're handy for some situations. With regards to modes I prefer even spacing, up there I suggested 11.1% - 33.3% - 100% (by 3x each time), albeit for slightly less difference a smaller multiplier can also do: 16% - 40% - 100% (by 2.5x each time). Of course this is just my point of view, but please bear in mind whateverfold increases in driving current/power at the emitter do translate in lesserfold light output increases.